(partial) Modelling and Control Laws: Closed mathematical description of line commutated converter-drives, K Hofer. Non-linear and linearized models for control systems including static converters, J P Louis. Identification and Observation: A novel approach on parameter self-tuning method in AC servo system, T Irisa et al. A microcomputer system for estimating the parameters of an induction motor model, A Gallo et al. New Methods of Control: Non-linear controller allowing for an upper bound on the system internal variables, G Celentano & P Marino. Speed control of an AC motor by state variables feedback with decoupling, P Feller. 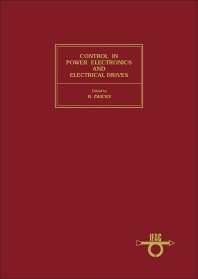 Adaptive and Sliding Mode Control: Microprocessor-based adaptive control for electrical drives, A Brickwedde. Adaptive control design in servosystems, A Balestrino et al. Current Converters and Inverters: Effect of source reactance on the controllable three-phase bridge rectifier operation with series R-L loads, S I El-Kassas et al. The family of commutation modes of converters, F Kehtari. Contains 97 papers which provide a valuable overview of the latest technical innovations in this rapidly expanding field. Areas of development which receive particular attention include the emergence of power switching transistors, the application of microprocessors to regulation and control of static converters and electrical drives, the use of more sophisticated control strategies and the utilization of power electronics in new application fields. For control, power and electronics engineers and scientists.